Home » General Interest » How was the order of our alphabet determined? Is there any particular reason why A comes before B or that Z is the last letter of the alphabet? What is an Alphabet exactly ? An alphabet is a fixed system of written signs, each of which, in theory, stands for one spoken sound. In an efficient alphabet, all the spoken words of a language should be able to be expressed by rearranging these letters. So what’s the origin of our ‘Latin’ Alphabet ? Unfortunately there’s no complete tidy answer and so it’s necessary to delve into the history of a few of the civilisations of antiquity. Accordingly in order to explain why our alphabet is in the order it is, we have to explore at least 5 different cultures. Thousands of years before the birth of Christ the Egyptians were part of an ever evolving process in which writing was being developed, initially to keep financial records and tallys but later to record narratives and histories using both stone carvings as well as on papyrus using a reed pens. 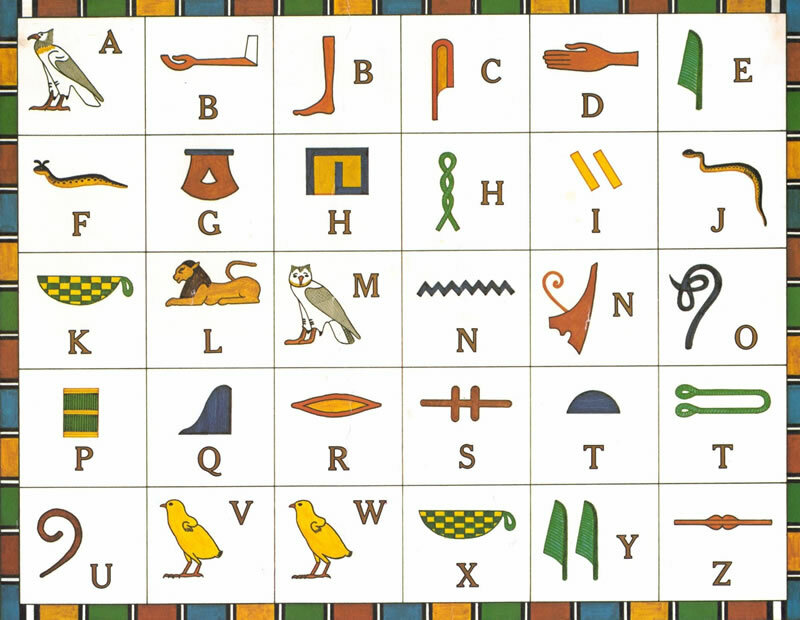 Although the Egyptians never created a proper alphabet, their hieroglyphics evolved considerably during the height of their ancient civilisation. At one point, they used over 400 different hieroglyphs, but their written language became more and more streamlined as it went through 5 distinct stages. Although the Phoenicians are widely hailed as the inventors of the alphabet it is now conceded that the first ABCs were in the city of Ugarit, in north-west Syria. A German scholar, Hans Bauer, found tablets that have Ugaritic letters displayed opposite a column of known Babylonian syllabic signs, proving that the Ugarits consciously ordered their alphabet. It is unclear whether this tablet was used as an instructional primer. Although the phonetics of the Ugaritic alphabet were identical to the Phoenician symbols, the actual script was different from the later Phoenician alphabet and from the earlier Egyptian and Semitic languages. The Phoenician alphabet was probably developed around the same time as the Ugarits’, but the Phoenicians were much more important in the history of language and writing, for they spread their alphabet throughout much of the world. The Phoenicians weren’t aesthetic types. They were traders and needed an alphabet not for literature or history (they didn’t leave behind any books) but for business – to track inventories, to standardise accounting procedures and other such mercenary tasks. 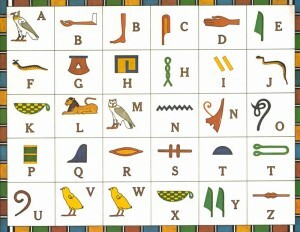 By 1000 BC, the Phoenicians were carrying their alphabet with them to most of the major ports of the Mediterranean. The Phoenicians completely dropped the picture signs of hieroglyphics and kept only the symbols that signified sound. For example the Phoenician’s word aleph meant ‘ox’, and the letter a was made to look like an ox’s head. The ox, the most important farm animal of the time, was the basis for the first letter of most European and Semitic languages, including, later, English with the letter ‘a’. The Greeks later adapted the Phoenician language to their own needs. They took 16 characters from the Phoenicians, all consonants. It was up to the Phoenician reader to decide where the vowels belonged in a given word. Technically, a consonant, according to Webster’s New World Dictionary, is a sound produced ‘by stopping and releasing the air stream (e.g. p, t, k, b, d, g) or stopping it at one point while it escapes at another (m, n, I, r) or forcing it through a loosely closed or very narrow passage (f, v, s, z). Consonants are formed by the vocal chords with the assistance of the tongue, teeth or lips. A vowel, on the other hand, is formed simply by the motion of the vocal chords, with no obstruction by the other speech organs. Every spoken language has vowels and consonants, but a remarkable number of ancient written languages did not include vowels in their alphabet, Phoenician was one of them. The lack of vowels in the Phoenician alphabet is about all that keeps it from being a modern language. The ancient Greeks were scavengers, taking their favourite elements from the Semitic and Phoenician languages, and synthesising their own. Around the 9th century bc, the Greeks added five vowels to what were essentially the Phoenician consonants, and these are the five vowels that English speakers can recognise, not only because the names of each vowel start with the five letters that are our vowels, but also because the names of all but the ‘o’ vowel have become household words themselves: alpha, epsilon, upsilon, iota and omikron. Alpha became the first letter in the Greek language. Sharp-eyed readers might ask how, if the Phoenicians didn’t have vowels, their aleph metamorphosed into the Greeks’ alpha. Actually, the alpha was taken from the Hebrew language rather than Phoenician, and its similarity to Phoenician is because aleph also means ‘ox’ in Hebrew. The first letters of the Hebrew alphabet are aleph, beth, gemel and dalth, which mean ‘ox’, ‘house’, ‘ camel’ and ‘door’, respectively. The Greek equivalents are alpha, beta, gamma and delta. The driving element in adaptation of written languages is whether the old language can express the sounds already verbally expressed in the adoptive country. The Greeks needed letters to express vowel sounds that already existed in their spoken language. The Phoenician alphabet did not have them, and although the Hebrew language did have vowel sounds, they were used erratically and sporadically. But the Hebrews did have some consonants that used sounds the Greeks did not have. This was the case with the first letter of the alphabet. in Hebrew, the aleph was a soft breathy sound that had no phonic equivalent in the Greek language. The Greeks took such ‘useless’ consonants from the Hebrews and converted them to vowels in the Greek languages. Thus, the Greek vowels were Hebrew in origin and the consonants Phoenician. By adding a few consonants of their own, the Greeks ended up with a 24-letter alphabet. By adding a few consonants of their own, the Greeks ended up with a 24-letter alphabet. They had no equivalent of our c or v, and some of their letters stood for sounds different from their modern equivalents. Their p, for example, sounded like our r. Still, their alphabetical order is roughly the same as ours today, with several notable exceptions, including the fact that their z was the sixth, rather than the last, letter of their alphabet. made a few changes. The Romans established the current alphabetical order used by English-speaking countries today, but their alphabet contained only 23 letters. J, u and w were introduced well after the birth of Christ. The letter j was originally used as a variant of the vowel i. Until the 17th century, Caesar’s name would have been spelled lulius. The w was expressed in Anglo-Saxon by the notation uu or u until about 900 AD. The u itself was used as a variant of the letter v. It wasn’t until the 18th century that the letter u was used exclusively as a vowel. Why did the Romans rearrange the order of the Greek alphabet? There were various reasons for the changes, perhaps none as interesting as why z got dumped at the end of the alphabet. At first, the Romans dropped the Greeks’ 6th letter altogether, figuring it was unnecessary. When Rome conquered Greece in the 1st century BC, the Romans decided they needed the letter back again, primarily in order to transliterate Greek words into Latin. By this time, however, the Romans had formalised their alphabet, and the z, having lost its rightful place in line, got sent to the back of the bus. Other Romance languages haven’t seen the need to reassert z’s original position. Clearly, the placement of letters in the alphabet was essentially an arbitrary one. It would make more sense, probably, to have all of the vowels lumped together separately at the beginning or end of the order: learning alphabetical order doesn’t matter much in helping to master English. Would we read or spell any less effectively if we learned the alphabet in reverse order? Yet the Ugant tablets indicate that the alphabet was taught in alphabetical order, and linguists have found in most cultures that lists of alphabets invariably were written in the same order, despite the fact that, unlike numerical order, the order of letters has no intrinsic meaning. So in reality it is the utter serendipity of our alphabetical order that makes the explanation to this question so disarming. Would anyone guess that a comes before t because, for an ancient Semitic culture, ‘ox’ came before ‘house?